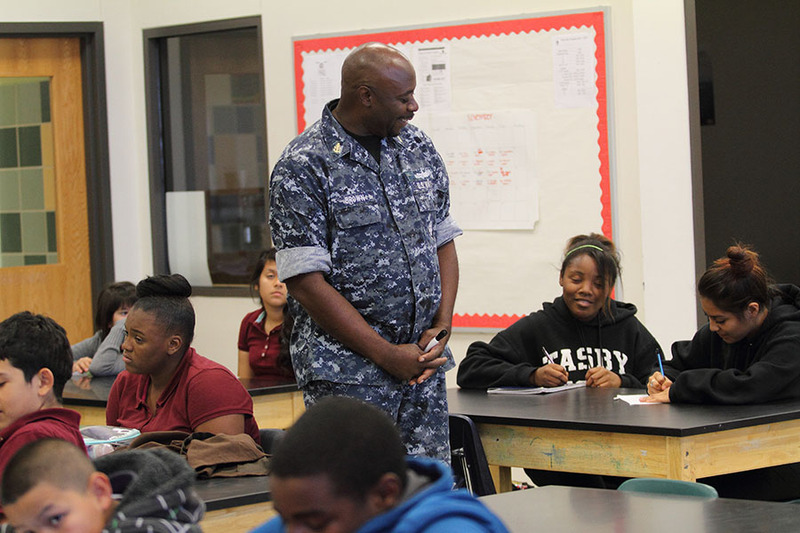 U.S. Navy veteran Frederick Brown teaches at Sam Tasby Middle School. Dallas ISD will open its doors to veteran families during a unique career fair next week. Individuals interested in attending the Veterans and Spouses Career Expo are encouraged to register online in order to take advantage of the offerings. The expo, which is 6-8 p.m. Wednesday, Nov. 16, at W.H. Adamson High School, will give veterans and their families a chance to learn about various employment opportunities in Dallas ISD. Ileana Morales Colón, a recruitment and selection coordinator for Dallas ISD, said the career expo will help veterans continue with their service, but in a different way. Colón said veterans’ varied skills could translate to the classroom. 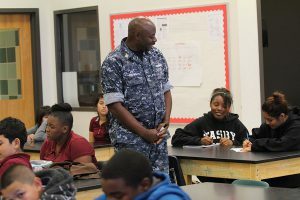 There are many retired veterans already working for the district, including Frederick Brown, a former chief in the Navy who now teaches at Sam Tasby Middle School. “I think leadership skills, the ability to work with limited resources, and the ability to enhance discipline, are key reasons why veterans would make excellent teachers,” he said. To find out more information or to register for the Veterans and Spouses Career Expo, visit https://www.dallasisd.org/hcmjobfair or send an email to imoralescolon@dallasisd.org.